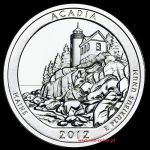 Released on March 13, 2000, this is the seventh coin released in the 50 State® Quarter Program and the second released in 2000. 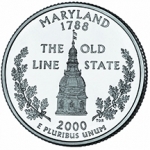 Maryland, admitted into the Union on April 28, 1788, themed the coin, The Old Line State. 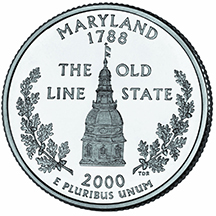 It highlights the Maryland Statehouse and is surrounded by White Oak leaf clusters and the nickname The Old Line State. 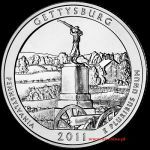 Other inscriptions included are: Maryland; 1788; 2000; and E Pluribus Unum. 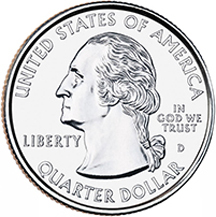 President William J. Clinton was in office when this legislation was signed. 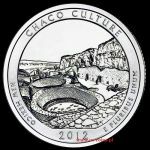 Three United States Mint Directors served under President Clinton's tenure; David J. Ryder of Idaho, Philip N. Diehl of Texas, and Jay W. Johnson of Wisconsin.